This article shows you how to send an email message to one or more members, families, members in a workgroup, or families in a workgroup. 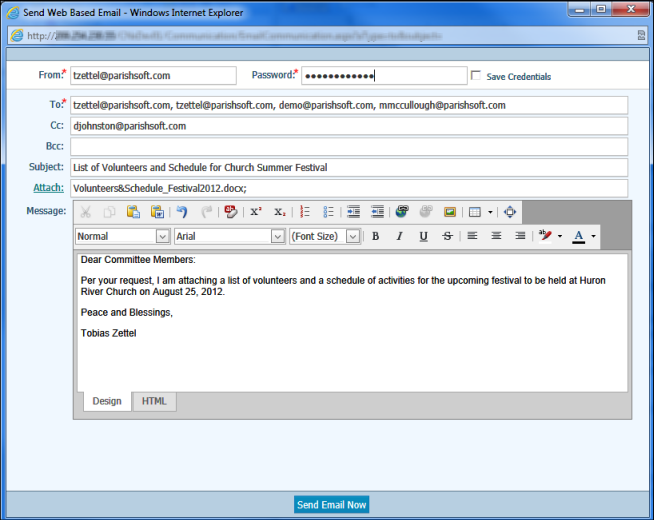 To send an email message, you need a Web-based email client or program, such as Gmail, Hotmail, or Microsoft Outlook. See the attachment if you are using a Google Email account as additional settings are needed. Important: First, you may need to send us information to set up your email domain on our server. This only needs to be done one time per customer. 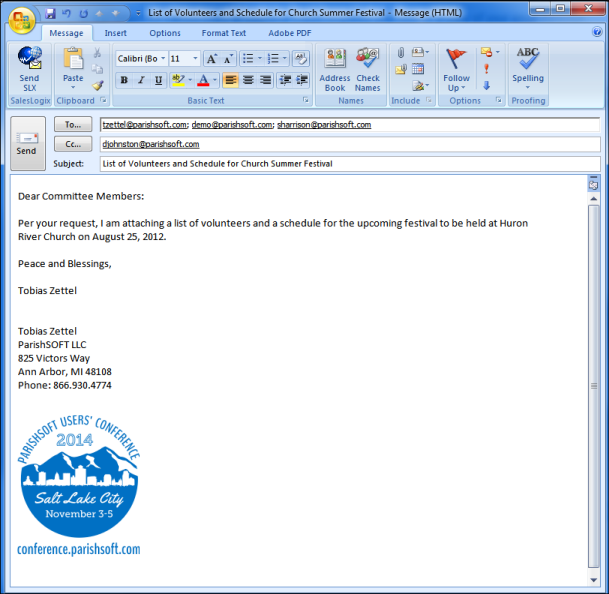 On the Family List, Member List, or Sacraments page, select the email recipients. On the Family Workgroups or Member Workgroups page, select the desired workgroup in the left panel to display its members. Then, in the right panel select the email recipients. Only unique email addresses are included. If you select multiple recipients who have the same email address, the application selects the first individual with that email address it encounters and puts that individual in the View Recipients list. Click to close the window and return to the Family List or Member List page. 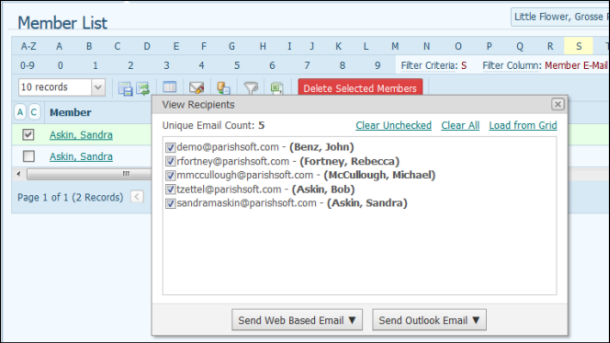 Select the names of individuals that you want to add to the View Recipients window. Click . The View Recipients window is re-displayed. The individuals you selected are added to the list. To remove all email addresses from the list, select Clear All. You can then add new recipients to the list by repeating Step 3. To remove one or several, from the View Recipients window, select the checkbox to the left of each individual's name. Then, select Clear Unchecked to remove them. To remove all email addresses from View Recipients window and load all unique email addresses from your selected recipients, select Load from Grid. If you selected recipients from a filtered list, the Load from Grid function loads all unique email addresses from that filtered list. If you selected recipients from your entire Family List or Member List, the application loads all unique email addresses from that list. To: recipients to whom you are directly communicating. If there are multiple recipients in the "To:" line, each recipient can see the email addresses of all other recipients. Cc: (short for Carbon Copy or Courtesy Copy) recipients who receive a copy of your email message. Bcc: (short for Blind Carbon Copy) recipients to whom you are not directly communicating, but whom you want to receive a copy of your email message. Email addresses of recipients listed in the "Bcc:" line cannot be seen by other recipients. If you want to remove an email address from the "To:" line, select and delete it. You can also cut or copy one or more email addresses from one line and then paste them into another line. ie. from "Cc:" to "Bcc:". You must use a comma to separate email addresses. Subject: Type the subject of your email message in the Subject: line. Attachments: If you have a file to attach, click Attach. Browse to the location on your hard drive and select the file. Click OK to close the Attach File(s) window. In the Message field, type the body content of your email message. Select one of these formats for the body content of the message. Design: Rich Text Format (RTF), the default message format for Web-based email. Supports formatting, including bullets and alignment, various font styles and sizes, and background and text colors. HTML: an HTML version of the body content for recipients who prefer HTML email. In the Password field, type the password you use to log in to your web-based email application. If you want the software to remember your password, check the Save Credentials box. To send your email message, click Send Email Now. To use Outlook, you must have both Outlook and Internet Explorer installed on your computer. Your browser must be Internet Explorer and you must also enable Internet Explorer's ActiveX controls. While enabling ActiveX controls is required to use this software to email through Outlook, check with your Information Technologist (IT) before enabling ActiveX controls to ensure it will not pose a security risk for your organization. To: typically used for recipients to whom you are directly communicating. If have multiple recipients in the To: line, each recipient can see the email addresses of all other recipients. Bcc: (short for Blind Carbon Copy) typically used for recipients to whom you are not directly communicating, but whom you want to receive a copy of your email message. Email addresses of recipients listed in the Bcc: line cannot be seen by other recipients. Outlook opens. By default, the application puts your email address in the To: line as the first email recipient. (Optional) Type (or copy and paste) email addresses in the remaining email recipient fields. Type the subject of your email message in the Subject: line. If you have a file to attach, click . Browse to the location on your hard drive and select the file. Click Insert to attach the file. To send the email, click .